Sixty questions of increasing difficulty. Sixty minutes. The ACT Mathematics Test leaves very little leeway for wasted time. With an average of only one minute per problem, every second counts! While high-quality test prep content is a must, students also need opportunities to hone test-taking strategies. Chief among them for the ACT is time management. 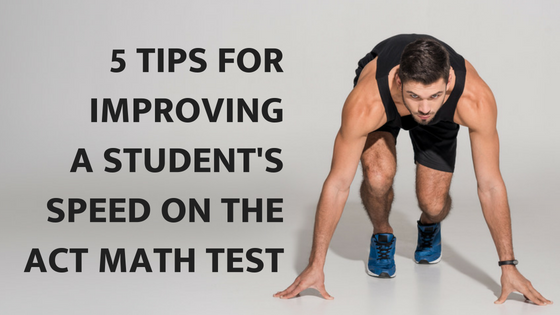 Once students have an understanding of the ACT Math Test format and subject matter, there are several time-saving skills to target that will help bolster a student’s speed and overall performance on test day. Reading directions on test day is a total waste of time. As a teacher, I cringe when I read that sentence, but as far as the ACT is concerned, it’s true. Students can’t afford to waste valuable minutes (or even seconds) scanning through the written directions. The reasoning is simple: The directions provided on the ACT practice tests and in the curriculum materials created by Clear Choice Prep are exactly the same as what will be on the actual ACT tests. After a full run of test prep, students should walk into the testing center having read the directions sealed inside their test booklets dozens of times already. Why read it all over again? Make sure your students know: when the test begins, skip the directions and dive into solving problems. The ACT Math test does not provide students with formula reference sheets like many other admissions and standardized tests do. This means students must have crucial geometry, algebra, trigonometry, probability, and statistics formulas committed to memory. Lucky for you, we shared 21 of the most important of these ACT Math formulas to memorize in a previous post! Students without a familiarity with these fundamental equations and processes will find certain problems on the ACT Math Test much more difficult (if not impossible), but that’s not the only reason they should be memorized. Sure, there are various workarounds for grinding through a problem when a relevant formula isn’t handy, but the more direct and streamlined the process, the faster a student can arrive at a correct answer and move on. Students who practice identifying when a problem calls for a particular formula and then employing it quickly can save valuable testing time in the process. The ACT Math Test allows students to use calculators throughout the entire assessment. But as this guy will tell you, just because you can, doesn’t mean you should! There are plenty of problems on the ACT Math Test that can be worked through with a pencil and paper (or even a mental calculation or two) more quickly than they could be solved relying on a calculator. That said, for those problems where a calculator is benefit, it is important that students are comfortable with the functions of their device. Test day is not the ideal time for some techy trial and error. Early in the test prep process, ensure students have their test day calculator in hand and are using it throughout their practice. Make it a point to help students self-evaluate which types of problems are best suited for poking buttons and which ones can be completed faster by hand. There’s no benefit to leaving any answers blank on any of the ACT tests. A guess has a chance of being correct while a non-answer is automatically wrong. However, students occasionally succumb to the ticking clock and simply run out of time to give a full effort to each problem. If practice tests show that this is a possibility for a student come test day, prioritization needs to be a…well…priority. As we covered in a previous post, the problems on the ACT Math Test are organized according to difficulty: the first 20 problems are easier, the middle 20 are at an intermediate difficulty, and the final 20 are the most challenging. Students struggling to simply complete the test must have a plan of attack to grab as much of the low-hanging fruit as possible. Focusing on the first 40 problems and guessing on the last 20 is likely to net more correct responses than rushing through the easier problems to give equal attention to the tougher problems at the end (read: the ones students are the least likely to get correct) and making careless mistakes along the way. The only way to know whether this type of hedging is necessary is to have students try full length, timed practice tests throughout the test prep process. Our final tip may seem obvious, but it’s amazing how often it’s overlooked. All this focus on time means nothing if students don’t have a way to track it. From the beginning of the test prep process, students should be practicing with a test-approved timing device. The easiest option is a cheap, quiet wristwatch. While every test center is supposed to provide students with access to the time, variables always pop up. A wall clock could be hard to see from a student’s seat. A proctor may neglect to provide the required updates. Rather than hoping for the best, students should be prepared for the worst. A simple, reliable wristwatch (…no fancy smartwatches or newfangled gizmos) should be a must-bring on any student’s test day checklist. Part of any comprehensive test prep program is giving students the support and advice they need to perform at their highest level. Be sure to subscribe to our tutoring blog so you’re always the first to know when we share new strategies, advice, and resources!